In the Dec. 1-7 edition, CBC Radio's Rick MacInnes-Rae interviews CISA3 associate director Tom Levy about his new findings that suggest copper from a mine in southern Jordan dates back to hundreds of years before anyone previously thought. Writing in her Culture Lust blog on the KPBS Web site, Angela Carone reviews the current show in the gallery@calit2, "Scalable City", by Calit2 artist in residence Sheldon Brown. In a special issue, Calit2 participant Jan Talbot is asked to comment on the future of the chemical engineering profession. Technology reporter Jeffrey R. Young interviewed Calit2 director Larry Smarr and others about the trends underlying plans for a Singularity University -- focusing on "the idea that computers will soon become smarter than people." Report on Metagenomics 2008, organized by Calit2 at UC San Diego. Art critic Bob Pincus reviews "Scalable City" by Sheldon Brown, Calit2's artist in residence at UC San Diego. The exhibit is on display through Dec. 15 in the gallery@calit2. 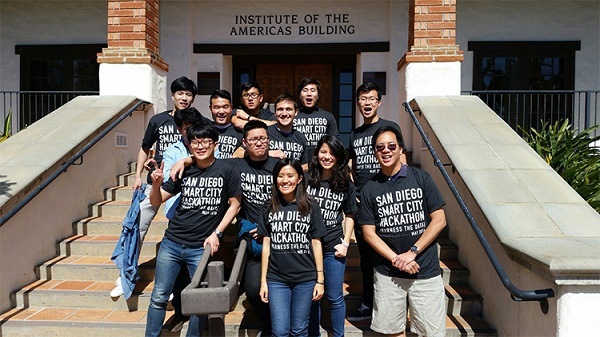 Writer Amelia Wilkinson mentions the recent agreement between the UC San Diego division of Calit2 and the University of British Columbia to collaborate on green IT. Calit2 director Larry Smarr is quoted in this article about a new type of computer, adopted for the first time by Calit2 at UCSD for the GreenLight project and proteomics research. Writer Rick Hodgin reports from SC08 on the launch of startup Convey Computer, and its sale of the first of a new generation of computer to Calit2 at UC San Diego. Calit2's Larry Smarr is quoted. Among the highlights of this year's Educause conference, Calit2 director Larry Smarr "showed off some innovative uses of humongous video walls for scholarshiop and teleconferencing."